In 1946, shortly after the end of World War II, a gentleman named Al Jenkins started a boot and shoe repair shop. Al believed that providing the highest quality materials, old-world craftsmanship, and stellar service were the only reasons worth opening his door every morning. Building on those principles, Al’s Bootery has grown into one of the largest boot stores in the Northwest. We offer boot/shoe repair on most major brands. We don’t sell clothing but have remained a footwear store since our inception. We offer one of the finest selections of western boots, ropers, workboots, steel toe workboots, hiking, hunting, chukkas, moccasins, and slippers. Over the years, we have tried to maintain a current website, but have found that to be almost impossible due to styles being discontinued, certain leathers unavailable, etc. With this in mind we have found that some of our customers prefer to either e-mail us at info@alsbootery.com or call us at 406-245-4827 to check on availability of a product. We also encourage you to contact us regarding a certain leather or style you may be seeking. 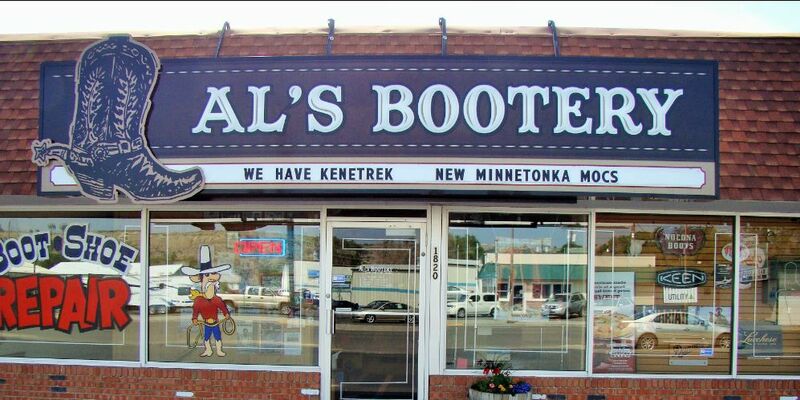 Al’s Bootery offers a full service boot & shoe repair shop. Jamie can answer those questions and can repair almost anything and any brand when it comes to boots and shoes. We also repair belts, purses, sandals and Birkenstock. Prices are $80.00 for 1/2 sole and heels and $105.00 for full. Additional costs may be incurred depending on condition of boots. Call, email or send them to Al’s to breathe new life into worn boots. Thanks for taking the time to check us out and we hope to help you in the future.